San Diego provides the perfect launching point for a whale-watching tour in California. Cruise on the Pacific Ocean in a sturdy boat with a professional crew, looking for gray whales as they migrate along the coast of North America. Dolphins, seals and seabirds are often spotted during this 3.5-hour whale-watching tour and the crew provides informative commentary about the marine animals and environment. Bonus: if the crew does not find any whales during your cruise, you receive a complimentary ticket for another trip. Between December and April the gray whale travels approximately 6,000 miles along the North American coast, from the cold waters of the Arctic to the warmer waters of Baja California. There, they give birth to their young and prepare them for the return migration to the north. As the gray whales head to the Arctic, the young calves are often seen swimming alongside their mothers. See these majestic marine mammals on a morning or afternoon whale-watching tour from San Diego. Make your own way to Navy Pier to board your boat, a sturdy and well-equipped vessel with both indoor and outdoor seating areas. Head out on the waters of the Pacific Ocean with your expert crew who provides informative commentary about the marine life that you may encounter, including different species of dolphins, seabirds, sea lions, seals and — if all goes according to plan — gray whales. Choose from a morning or afternoon tour that works with your schedule. At the end of your 3.5-hour tour, your captain returns you to Navy Pier. Guarantee: Viewing whales in the wild is a breathtaking experience, however mother nature can be unpredictable. If whales are not sighted during your tour, you'll receive a 'whale check' for another complimentary whale-watching or harbor tour. Crew and volunteers were great. Whales were incorporative. We could not get close. 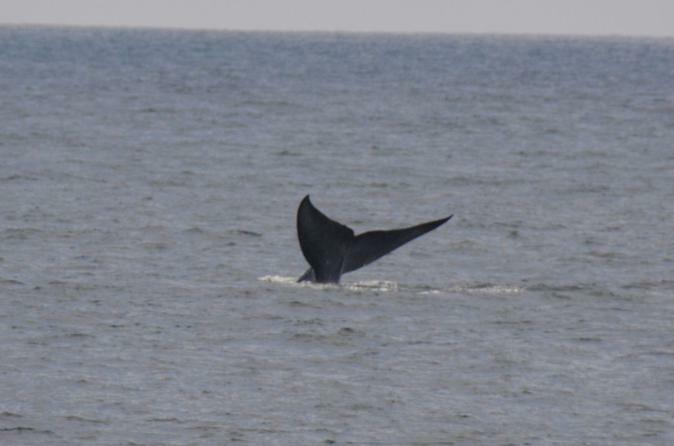 Could only see whales backs, few tails and lots air blows from a distance. We got to see a group of dolphins which came up to ship, that was great. Got to see sea lions too. Weather was cold and rainy. Maybe more info about the harbor and the sights. A wonderful experience! We saw A LOT of gray whales, sea lions, dolphins... Definitively the best whales watching ever! We enjoyed our trip and saw 3 humpback whales and 1 fin whale. The captain was very good at pointing out the whales and hanging in the area while we all watched the show. I would recommend this tour! It was cold out on the water so be sure to bring a jacket if you go in February. Also the water was rather rough, so if you tend to get sea sick, be sure to take something! Wonderful trip saw couple of fin whales even though not many whales seen the trip was great, beautiful day, ocean was calm with only a little swell. The crew members were friendly, information was relayed clearly and precise keeping us up to date all the time. Would not hesitate recommending this trip. 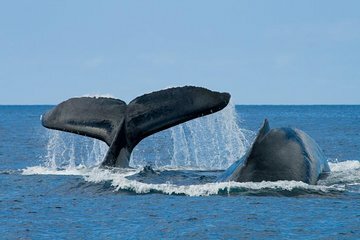 Spectacular sights of whales on their way to the warm waters of Mexico for breeding. Never expected to see so many!! Great excursion! ! They make every effort to get you to a whale!